This past weekend the kids and I went to the sweetest little girl birthday party. It was a butterfly theme with many handmade touches and I thought I would share some of my handmade contributions. First, this tablecloth made from an old duvet cover. I removed the cotton sashing, sewed the the squares together to create a patchwork design, made sure the embroidered "S" was in the center (perfect for Sophie - the birthday girl), and used the reverse side of the duvet to make a border along the four sides of the tablecloth. It worked beautifully for her party's theme and will make a great summer picnic blanket. I didn't get the greatest pictures, but this fabric bunting turned out to be such a wonderful and quick project, I have to share what I have with hopes that many of you will find it useful. I first saw this scalloped fabric garland tutorial while visiting Sew, Mama, Sew! and knew it would be perfect! I didn't bother downloading the garland template PDF because it all seemed a little small to me. Instead I made a half circle pattern of my own by tracing half way around an 8" wooden embroidery hoop. And had myself an afternoon fabric bunting picnic, with the Avett Brother's playing, right here on my living room floor. Ah, Bliss. It only took about 1 hour from start to finish. It was the picture taking that was the challenge. How does one take a picture of something 3 yards long, with an AWFUL camera? 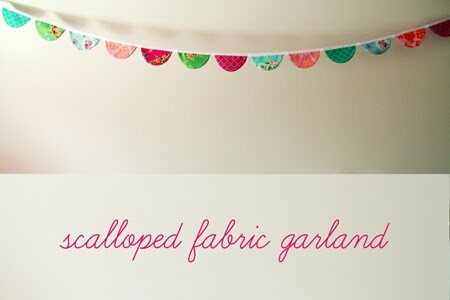 Which explains why I used the "scalloped fabric garland" photo from Sew, Mama, Sew! i found your blog through the etsy forums, have a great day! So sweet. I love the scalloped garland. Wow, wonderful job!!! I absolutely love the garland, what a wonderful handmade touch! Looks like a fun project and way cuter than the $1 streamers I always buy! A. I thought I was winning the Green Home ! B. LOVE that table cloth !!! C. The outside picture is very cute. D. So is the garland. A. I thought I was going to win that Green Home ! B. LOVE that table cloth !! C. The outdoor garland picture is cute ! That tablecloth is just lovely. It's beautiful! I've been wanting to make one of these myself. I love buntings!